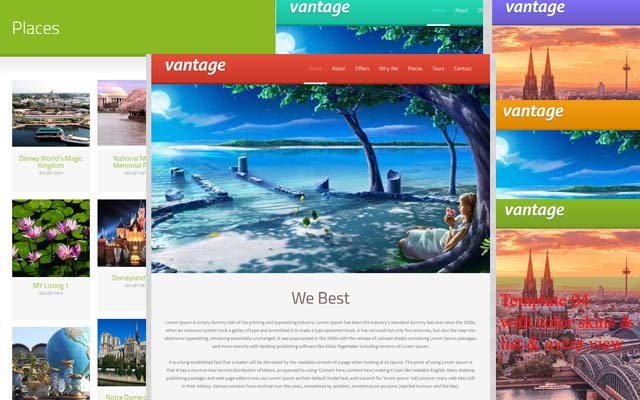 This plugin allows a Vantage website user who creates a listing and/or event to create their own website page with complete details (like a normal separate website – an attractive presentation of profiler dashboard). 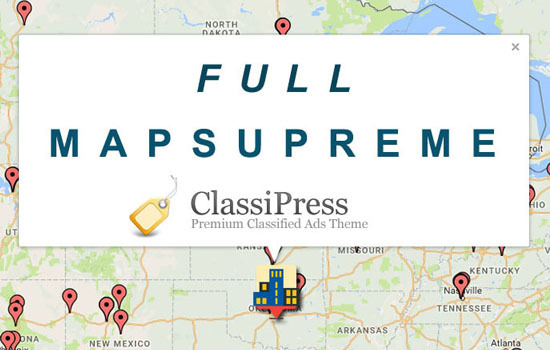 The plugin adds five attractive and clear responsive designed one page website templates for each user to choose from. The main idea behind development of plugin is right now any user only create listing and/or events and get the detail page but by the use of the profiler plugin the same user has created own website page also with more detail of user profile to present himself in perfect way. The Vantage user can add contents and settings from their edit profile page just like a normal user can edit their profile. 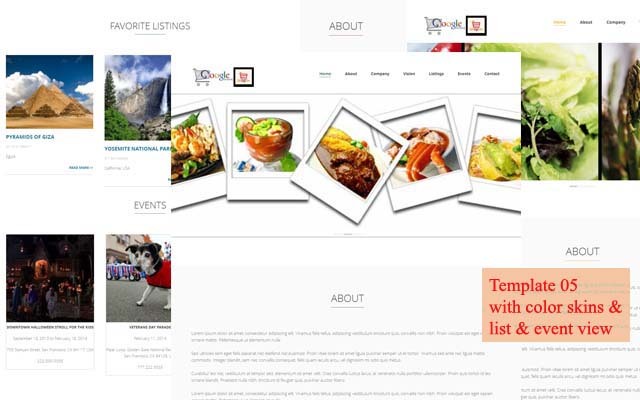 The user can see the additional feature options like logo image, three content (CMS) sections with title and description, three banner image options for animated jQuery slider, about content, website page SEO title option, listings and events related titles, show/hide options also favorite listing and events options. and the most important is template selection section. User should complete the necessary settings and add content as per his requirement and see the site preview from the link over same profile page. Any visitor can see any user website page from listing/events detail page as the plugin adding the button for website page liked visitor can directly view the complete detail like a website. Form admin side – admin can manage template, set default template…. While from front end user can add content, add/change logo,banners,about content, 3 other additional content, listing & events related settings and change template. Interface is easy to manage so don’t worry about settings..
5 attractive one page templates for user website with plugin. Clear & attractive templates design. Options and facility of adding new templates with help of proper development no headache of change any plugin core code. Just like plugin & play. 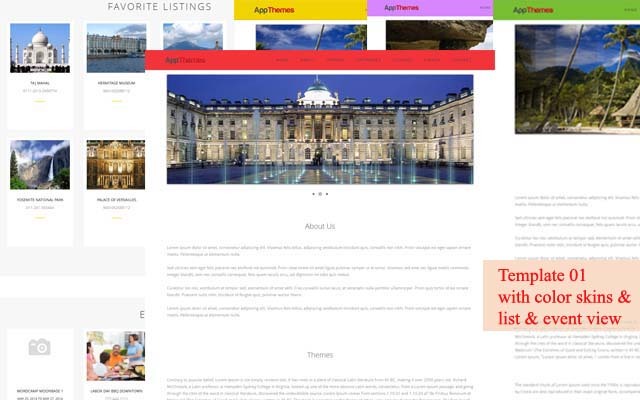 The website page will look like normal one page website page which included logo, menu, slider, about us, contents, Listings, Favorite Listings, Events and Favorite Events added/selected by the user only. The website page will display only user own data not any of other data like you can see on dashboard. User can change the logo for their company (make sure the logo size should be as per the template selected). 3 additional content (CMs section) given from where user can add any of content or HTML data like company details, faq, or any thing. Animated sliding with 3 banners can managed by user (user should add banner as per selected template design. It may be full size banner or small banners). SEO title option for user website page change. Listing title change option, show/hide own listing from user website page, show/hide Favorite listing same way. Events title change option, show/hide own events from user website page, show/hide Favorite events same way. Social media interface also added with template in footer section (may changed as per template design) which should be added by user from profile page. Public Office Email address for inquiry is given which is options but will display with social media settings. Contact details which included contact address & phone number. From Contact address, google map will be generated so address should properly & correctly added. for the website page as per settings of wp-admin > plugin settings. his website will be display accordingly. User should make necessary settings and add contents in proper format and update profile. Once profile updated data will be saved and user can see his website page from Preview link over there. User can select any of template given in the options on the profile page. the developer can make new temple easily for you. will be double because more user can use same template with different color skins. Default Enabled – Profilter page will created automatically and display for all users. Disabled – Profiler page will disable for whole site – none of profile webpage will be displayed. Moderator Enabled – admin should selecte the user for whom he want to enable the profile – only selected profile will be enabled and public on front end rest of all will be displayed with disabled notice. Make your profile web page attractive by manage content by Tiny-Mce editor. Tiny Mce textarea editor added on edit profile form page for content area. Now you can add image, style content and all via editor easily. What is basic fundamental of profiler plugin? ==>The plugin mainly reform the user dashboard, mean by the use of plugin profiler can get an attractive presentation of dashboard in the form of website page in addition with logo & many other things. What is profiler plugin for? ==>Allow user to create own website page which included logo,banners,listings, events, contact details, social media & many more…. in the form of attractive one page website. How the profiler plugin exactly working? ==>The plugin allow the registered users to make own website page. Mean they are given the additional features on edit profile page to create own website page with their details like banner listing, about content, contact details section, 3 additional sections (to add FAQ, Company details, or any other details on website page), listing, favorite listings, events, & favorite events. 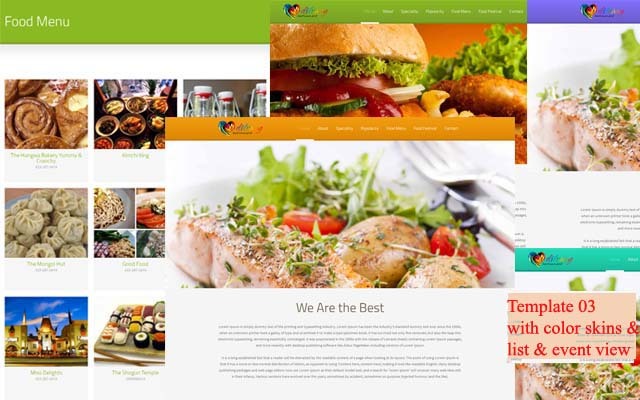 5 different beautiful & attractive responsive one page designed templates are free with plugin so user can select any of template as per they like most. What I can do to create profiler webpage? ==> You should go for edit profile page and see the extra settings added by plugin. You should set settings as per your need. Plugin not working for me? ==>please make sure the “author.php” file is exists in your current theme root. root folder, via ftp manually. Who can use the plugin features? page. As bydefault the website page created but without necessary settings & content it may be not display properly. How to manage existing templates? ==>you can active or deactive the current existing templates from wp-admin > Listings > Profiler Plugin > settings page. How to add new tempalte? ==>For new template you should need good developer who has good knowledge of vantage or hire our team member. Get any of template folder and follow the code & folder structure. 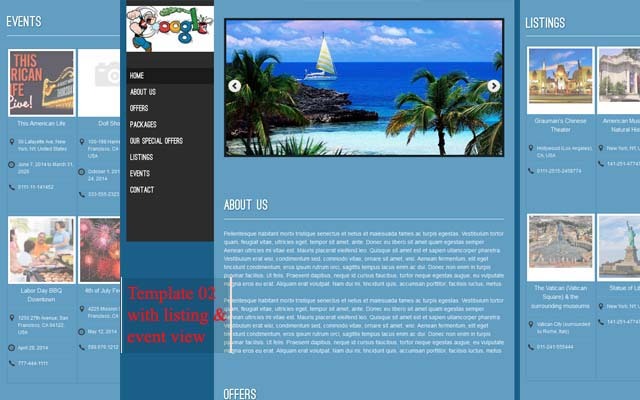 Add your html look with the php code for template. It is easy for any good developer. Please follow the developer notes given in readme.txt file with plugin. What are limitations of the plugin ? ==> The concept of developing the plugin is create website page for profiler but you can set only limited options that are added in edit profile settings page. — You can upload only logo & slider images not any extra images. — But yes if you want to add external image like uploaded on any other website and you can use those image in content section in the form of HTML tags to represent your idea for your profiler page. Why cannot upload my image ? ==> You can upload only logo & slider images not any extra images because if every profiler add own image and it may full the memory space of website hosting server and may cause problem for website owner. How to change profiler SEO url? How to enable/disable/moderate profiler webpage from wp-admin? Go to wp-admin > Profiler Plugin Settings page > Profile Page Create Options, you can also enable the profiler webpage settings only for specific users in the moderator mode. Make settings as per you want. — Last security update, users cannot post new ad, problem solved. — After this update, only administrator and editor can manage and see the edit page link on front-end website. — Reset “Media Upload settings” from plugin settings after this update. — Vantage version : 4.0 – Profiler settings not display – Problem solved. — SSL (https) enabled but not work for some server, problem solved. — Social media icons changed. — New profiler link created. — Events option removed from profiler page as per new upgrade and it will work for older version as well. — Removed extra menu links from each pages and you can see only about page link and on click you can see all other content by scrolling the page. — CSS changes for edit profile page and other necessary places as per new design. 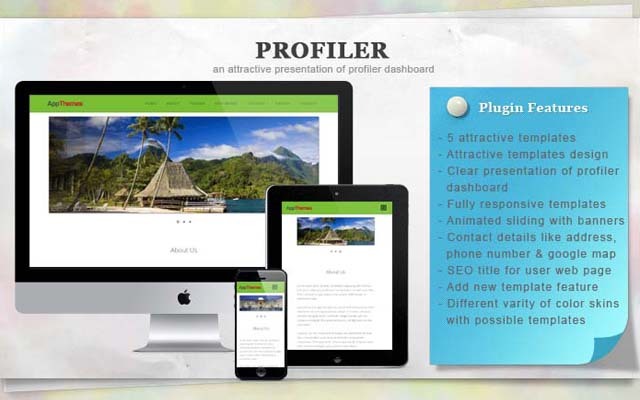 — You should create new profiler page. 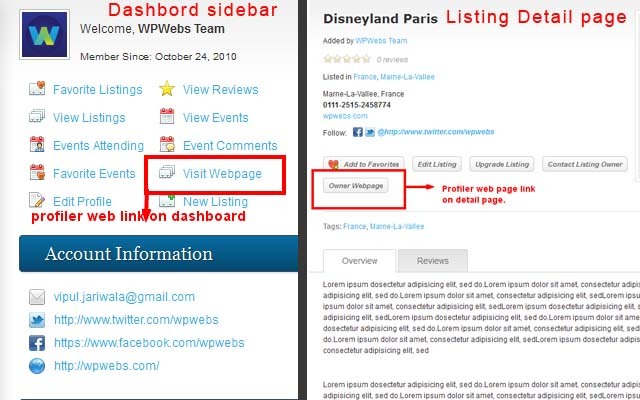 — Select profiler page from wp-admin >> Listings(left menu) >> Profiler Plugin >> Select Profile Page >> Select the page you have created. — Tiny Mce editor added on edit profile form page for content area. — Now you can add image, style content and all via editor easily. — Some Css change as per editor content. && “Moderator Enabled – User Profile Settings” >> user is selected. ==>Before this version the user profile was disabled only if any user edit profile — which was bug and it is resolved. Now as as soon as wp-admin > enable or disable user profile — it will be affected display/hide pofile – correction done. 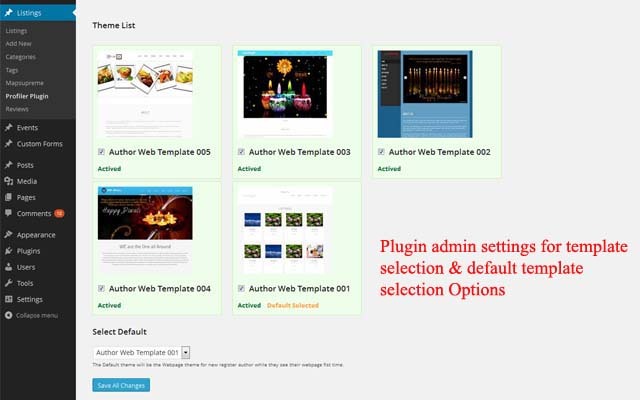 — Author edit profile > Visit Webspage > wrong webpage url – SOLVED – now it is OK.
— Show all templates for wp-admin > Default Template selection (previously it was show only selected template in select box). — Edit profile (on front end) > if not any active template > theme selection will be hide for users. — wp-admin side edit profile plugin settings not working – SOLVED – now it is working ok.
— Banner image delete option added – now user can delete banner if they want. — Edit profile proper title settings done. ==> to wp-admin > plugin settings > save settings once to get all updated up to date. A good Value, why not? This plug-in is a cool feature. It makes a 1 page, web site… or kind of like a landing page for your directory members. You have about 6 templates to choose from. It is NOT something that is absolutely stunning or mind blowing… the plug-in is only $39… but, for $39… I think the value to your members is very high!… and it gives you another feature to make your directory interesting to would be customers. Watch the video in the top right corner. Loved this idea especially for my site as some of my customers don’t have websites, so will be an invaluable tool to them and really adds value to my site. It is great if you have someone with multiple listings as it bring them all together allowing users to see what else they have to offer. It also allows people listing more space to talk about themselves as an organisation that they may not be able to do in a listing, really giving a good overview to users. I was also impressed with the customer service, I got very quick responses to my questions and the small issues I had. They also listened to my issues/suggestions and implemented the changes to improve the plugin which is really great service. Can the users use custom URL for the webpage? or what will URL for users? User can change any url as per they like. Even you can see different users profiler link on demo home sidebar.